Temperatures stayed cooler than normal throughout the period, following the bar we set in early July quite consistently. Fall shorebird migration expectedly kicked it up a notch in mid-July, but unfortunately, the West Dike at Back Bay NWR was closed at the end of the day on 15 Jul. Consequently, the East Dike was opened on 16 Jul, which sadly does not afford views of the prime shorebird habitat of the C Storage Pool. Last year it wasn’t until early August when the switchover occurred, so there was certainly some disappointment in losing access as we head into peak shorebird season. 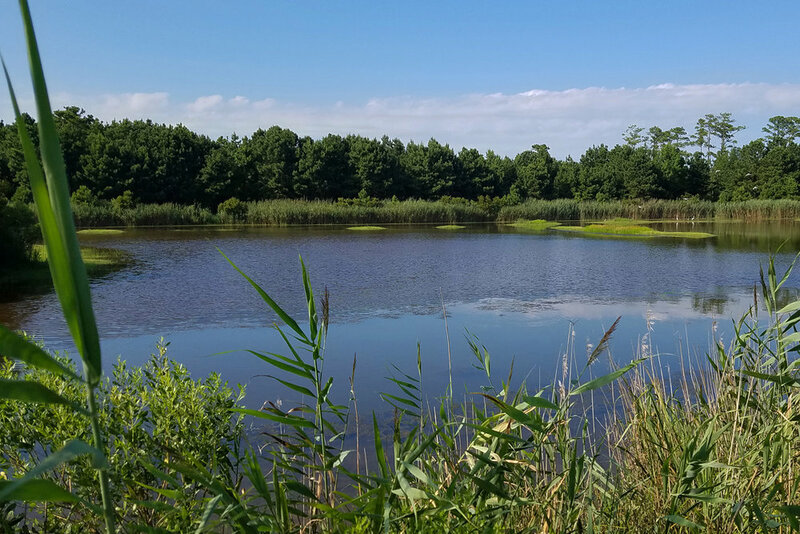 Compounding the frustration, the impoundment at Princess Anne WMA’s Whitehurst Tract that had been holding shorebirds was flooded on 18 Jul. The mudflats featured in many of the photographs below have now unfortunately vanished beneath the water’s surface. However, we Virginia Beach birders are nothing if not resilient, and a great many birds were still found, despite our habitat issues! Top records for mid-July in Virginia Beach included new unseasonal reports for BLUE-WINGED TEAL & PEREGRINE FALCON, early first-of-fall arrivals for SOLITARY SANDPIPER & PECTORAL SANDPIPER, and first-of-fall arrivals at or after expected dates for SEMIPALMATED PLOVER, LESSER YELLOWLEGS, PIED-BILLED GREBE, BLACK TERN, PIPING PLOVER & WHIMBREL. While we’ve spent the last few periods making mention of the lingering, unseasonal, Tundra Swan at Back Bay NWR, it appears that 9 Jul (obs. Andrew Baldelli) will mark the last record for this individual as it has not been observed since. When the persistent north winds pounded the coast throughout the latter half of early July, the waterways that protected this bird from would-be predators dropped markedly, likely allowing for a coyote or fox to move in. Or, perhaps it found a hiding spot further back in one of the impoundments? In either case, it hasn’t been reported as of this writing. In its place, a new waterfowl species took up the position of being an unseasonal occurrence this period, that being a single BLUE-WINGED TEAL at the park on 16 Jul (obs. Robert Ake). With an expected spring departure date of 10 May and an expected fall arrival date of 25 Aug, it would be more likely that this is a very early fall migrant, but it’s always possible this bird could have over-summered somewhere in the impoundments at the park. A single male was observed at the park on 24 May (obs. Andrew Baldelli), so perhaps it stayed? Whatever the case, it’s a great late summer record for the area, and it’ll be interesting to see just how long we have to wait for the next record of this species. Also unusual for the summer months in Virginia Beach, a female PEREGRINE FALCON was observed bombing the mudflats at Pleasure House Point NA on 18 Jul (obs. Andrew Baldelli) during a shorebird-watch. This species has an expected spring departure date of 15 May, an expected fall arrival date of 15 Aug, and only one other summer record for 2018, being a single flyover on 4 Jun of Lake Smith (obs. Tracy Tate). There is a summering population on the Eastern Shore, and there may be one or two hanging around the taller buildings of Town Center, and in nearby downtown Norfolk, but summer sightings are tough to come by nonetheless for this species. Continuing the arrival that were noted for shorebirds in early July, our first SOLITARY SANDPIPER of the fall season was detected 12 Jul at Princess Anne WMA’s Whitehurst Tract (ph. Rob Bielawski). Interestingly, the Gold Book lists the average fall arrival for this species to the coastal plain of Virginia as 25 Jul, and more recent eBird data specific to Virginia Beach has seemed to show that 20 Jul is a bit more accurate to our part of the coast in a typical year. Last year, an individual logged 15 Jul made for our earliest eBird record in the city, and this 2018 record now eclipses that mark as the earliest documented arrival in the system. The Gold Book does mention “Straggling northbound migrants have been recorded as late as 9 Jun, and the first southbound migrants have appeared as early as 1 Jul (with multiple records from the first few days in July), but there are no records between 9 Jun and 1 Jul.” So, if you’re one of the folks who have observed this species during early July, make sure to get those reports input to eBird. With this very early record, a bit of time passed before a second individual was observed, that being a pair observed on 19 Jul at Back Bay NWR (ph. Andrew Baldelli), also ahead of that expected 20 Jul arrival date! Another early shorebird arrival occurred when four PECTORAL SANDPIPERS were observed at Back Bay NWR on 16 Jul (obs. Robert Ake). A single bird was photographed at adjacent False Cape SP on 18 Jul (ph. Steve Myers) and a pair was observed again at Back Bay NWR on 19 Jul (obs. Andrew Baldelli) ahead of the expected fall arrival date of 20 Jul. In recent years, first records for the fall season for Pectoral Sandpiper occurred as follows: 14 Jul 2017, 16 Jul 2016, 4 Aug 2015 & 28 Jul 2014. The Gold Book provides a 20 Jul average date for the coastal plain, though recent years appear to paint the picture of being closer to a 15 Jul average. Quite a few other species made for first fall records in mid-July, at or after their expected arrival dates. A single SEMIPALMATED PLOVER was observed as it moved around the C Storage Pool at Back Bay NWR on 15 Jul (obs. Andrew Baldelli), matching the expected 15 Jul arrival date for the species. A group of eight LESSER YELLOWLEGS was observed on 12 Jul at Princess Anne WMA’s Whitehurst Tract (ph. Rob Bielawski), falling just two after the expected date of 10 Jul. While we did have a couple of summer records, a single PIED-BILLED GREBE photographed at Back Bay NWR on 18 Jul (ph. Steve Myers) is more in-line with what would be considered a first arrival at three days after the 15 Jul set date (the others could potentially have summered). Our first BLACK TERN for the season was observed flying over the impoundments at Back Bay NWR from the West Dike on 14 Jul (obs. David Clark), being four days after the expected 10 Jul arrival date. Also four days after the expected date, a group of five PIPING PLOVERS was photographed on the beach at False Cape SP on 19 Jul (ph. Andrew Baldelli). This species breeds both north and south of us on the coast, but due to our beach habitat being compromised by vehicles and beach-goers, it exists only as a transient here, typically passing through in spring from 15 Mar-15 May, and again in fall from 15 Jul-15 Oct. Lastly, a single WHIMBREL was observed during the mid-July beach survey at Back Bay NWR on 16 Jul (obs. Robert Ake), six days after the expected 10 Jul arrival date. One Whimbrel was photographed at Back Bay NWR on 19 Jul (ph. Andrew Baldelli) and four additional were also observed at Pleasure House Point later that same day (obs. Andrew Baldelli). Some interesting but not necessarily ‘noteworthy’ observations that occurred this period included a pair of AMERICAN BLACK DUCK reports out of Back Bay NWR. One individual was observed on 14 Jul (obs. Andrew Baldelli) and a pair were found on the mid-July impoundment survey on 16 Jul (obs. Robert Ake). This species is highly sought-after in the summer months in Virginia Beach, with most records occurring at the refuge. At this time of season, sometimes eclipse-plumaged Mallards can cause identification confusion, so it is worth examining the field marks that help differentiate the two species closely. PURPLE MARTINS appear to be amassing into groups along the coast ahead of their southbound fall migration, and high counts have popped up across the region. In similar fashion, the counts of waders skyrocketed during mid-July, with 118 GREAT EGRETS observed in view simultaneously on the C Pool of Back Bay NWR on 15 Jul (obs. Rob Bielawski). Not one, but two GREAT HORNED OWLS were observed out and about during the daytime hours of 18 Jul near the intersection of Nanney’s Creek & Mill Landing Roads (ph. Karen & Tom Beatty), and shortly thereafter, a vocalizing NORTHERN BOBWHITE was photographed perched atop a power line at Morris Neck and Munden Roads (ph. Karen & Tom Beatty); something that I’ve never heard of, much less seen out here. Being a first photographed record for this species in the city this year, our collective total of species documented by photos in 2018 has now rised to 247, with 270 observed! Breeding bird observations expectedly began to slow a bit in mid-July but the 2nd Virginia Breeding Bird Atlas has continued to bring in a great number of checklists! Scattered breeding bird confirmations were photographically documented around the city this period as follows: a recently fledged TUFTED TITMOUSE at Princess Anne WMA Whitehurst Tract on 14 Jul (ph. Rob Bielawski); a PROTHONOTARY WARBLER carrying food at West Neck Creek on 15 Jul (ph. Charlie Bruggemann); an OSPREY nest with young at Pungo Ferry Landing Park on 16 Jul (ph. Karen & Tom Beatty); a HOUSE WREN nest with young in a residential backyard on 19 Jul (ph. Carolyn Page) and an OSPREY nest with young in Kempsville on 20 Jul (ph. Laura Mae). Keep up all the great work Atlasing folks, and please remember, if you have any questions regarding the project, please check out the 2nd Virginia Breeding Bird Atlas Website, the official Atlas Facebook Page, or the Facebook Group for more information! Ruby-throated Hummingbird / 20 Jul / North Landing Rd. WEATHER: Over all, average daily high temperatures rose 0.6° from 85.6° F to 86.2° (-1.6° from prior 10-year average), with average daily low temperatures falling, 1.2° from 70.5° to 69.3° F (-3.0° from prior 10-year average). Daytime temperatures ranged from a minimum of 64° F (14 & 19 Jul) to a maximum of 93° (11 & 17 Jul). A total of 1.04” of rain fell during the period, spread across three days with measurement amounts, with a maximum of 0.81” falling on Wednesday, 11 Jul. Maximum sustained winds at Oceana this period were 17 mph and gusts reached 24 mph (17 Jul). No significant tidal surge events (2’ or greater) impacted the Sewell’s Point tide gauge during this reporting period. Sunrise/sunsets varied from 5:55 AM/8:26 PM (11 Jul) to 6:01 AM/8:21 PM (20 Jul), which means we lost 11 minutes of daylight during this period with a total of 14 hours, 20 minutes of ‘Length of Day’ to close the period. For those hoping to view every photograph submitted for Virginia Beach during this period, please see the complete listing for the month of July located on eBird’s Media explorer by clicking here! Please remember, anyone with an eBird account also has the ability to rate these photographs (1-5 stars), and based on the average rating, this is how eBird populates anything media-driven on the website, particularly the Illustrated Checklists! So, if you're one of the many folks who enjoy looking at photographs of birds, take some time to click them all and rate them, it helps make eBird better and better each day! LOOKAHEAD: As mentioned in the introduction up top, Back Bay NWR’s East Dike is now open, but sadly the West Dike is unfortunately now closed. The East Dike provides a nice view of the H Pool, which often has shorebirds on it in Jul/Aug, so long as the water levels are proper. The impoundments at Princess Anne WMA are all flooded now, so it may not prove worth checking for shorebirds, but something else could pop up here (Spoonbill?). With regards to annually expected fall arrivals, as of the reporting period close date, we have not yet logged first arrivals for WESTERN SANDPIPER & RUDDY TURNSTONE (all 10 Jul average expected arrivals), RED KNOT & STILT SANDPIPER (20 Jul) and DUNLIN (30 Jul). We’re still early for passerine/songbird/landbird migration which is more of an Aug/Sep/Oct occurrence, so shorebirds should remain the focus in late July. The coastal beaches of First Landing SP, the Resort Area & North End, Little Island Park and Back Bay NWR, as well as any low-tide marshes like those at Pleasure House Point NA and flooded fields will become highly sought-after locations to search for shorebirds as we move deeper into July. With a lack of impoundment habitat publicly accessible at this juncture, the beaches and tidal mudflats are really all we have going for us with regards to shorebirds. Make sure to get out early and late in the day, and try to work around the beach crowds is my only advice at these locations.